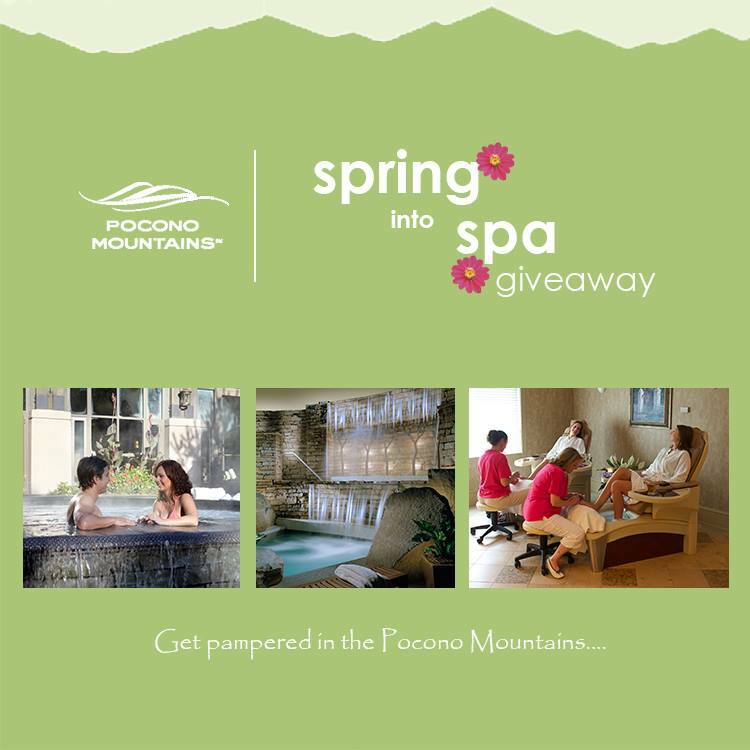 Check out the Pocono Mountains Visitors Bureau Spring Bucket List for a chance to win the adventure of your choice. The list of fun activities includes fabulous and diverse offerings. 1) Get behind the wheel before the professionals! Pocono Raceway, home to the infamous “tricky triangle”, offers a Stock Car Racing experience. Before the first Race Weekend in the Pocono Mountains this June, get behind the wheel of a 600 horsepower Sprint Cup style stock car beginning in May. The car reaches up to 160 miles per hour allowing drivers to feel the rush that until now was only known in the racing world. 2) Did you miss your chance to drive a team of dogs through the snow? No worries, dryland dog sledding is also available in the spring. 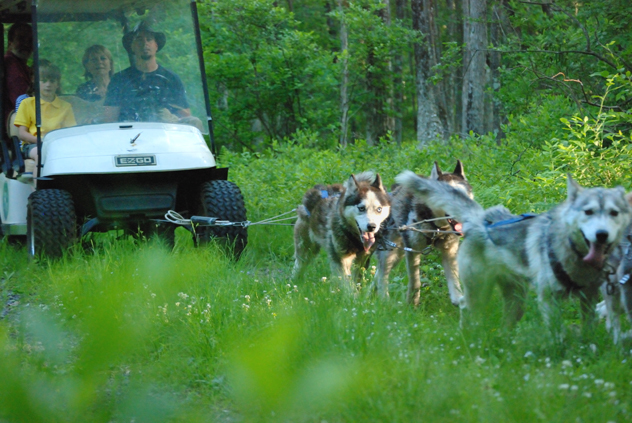 Skytop Lodge allows guests to drive the same first class team of dogs that have participated in the Iditatord, with a golf cart while dryland dog sledding through the Pocono Mountains. 3) Experience the rush of skydiving this spring! Jumpers will experience the thrill of free-fall from 13,500 feet above the Pocono Mountains. As the canopy opens, skydivers will float to the ground while enjoying the views of the mountains, the Delaware Water Gap and the New York City Skyline. 4) As the landscape begins to green, soar down the mountain while ziplining. The zipline adventure at Kittatinny Canoes is over 3,000-feet-long and reaches speeds of over 50 miles per hour as it zips through and over trees 150 feet above the ground. 5) Catch the region in bloom from the CBK Mountain TreeTop Adventure Course. The exhilarating obstacle courses are set in the natural mountain environment with over 100 aerial obstacles including ziplines, suspended bridges, scramble nets, swinging logs and much more. 6) The Big Day Out at Pocono Whitewater occurs most weekends April through October. The day begins with a mountain bike ride between the 1,000 foot walls of the Lehigh Gorge Rail-Trail to the famous Glen Onoko. The adventure continues with a scenic hike to an abandoned railroad tunnel with beautiful overlooks of the Lehigh River. From there, adventurers will whitewater raft the bends and rolls of the Lehigh River. Accomplishing the bike, hike and raft in one day will score any outdoor thrill seeker bragging rights. 7) The Leigh River Gorge provides a picturesque setting for a bike challenge. Pedal 25 miles through an abandoned railroad bed and follow the river through the Leigh Gorge State Park. This scenic journey takes riders past fantastic rock formations, tumbling waterfalls and plentiful wildlife. To enter, go to https://www.facebook.com/PoconoTourism, and look for the contest entry. Comment on their Facebook page about the activity you’d like to try. If you enter by 9:00 p.m., March 18, 2014, you have an added chance to win a prize from Naturally Kneaded Massage & Wellness. Categories: Contests, Pennsylvania | Tags: Adventure Course, Adventure Travel, Bike Challenges, Bike Rides, Dog Sledding, Mid Atlantic Region, Mid Atlantic Travel, NASCAR, Outdoor Adventures, Pennsylvania, Pocono Mountains, Sky Diving, Sports, Stock Car Racing, Stock Car Racing Experience, White Water RAfting, Zipline | Permalink. Dover International Speedway is pleased to announce that beginning with the 2013 season; it will offer its customers Flash Seats®, an innovative, paperless ticketing system that gives ticket holders electronic venue access using nothing more than their credit card. Flash Seats is the electronic ticketing system of Dover International Speedway’s ticket provider, Veritix®, and includes a number of great benefits for fans. Flash Seats allows fans to conveniently swipe in on race day with no paper tickets, using a credit card; to easily transfer tickets to anyone electronically, anytime, anywhere, right up to the start of the event; and to eliminate lost and stolen ticket issues. Dover, the first NASCAR track to utilize Flash Seats, will offer the new ticketing option as a replacement for print-at-home tickets, and as an alternative for traditional track-printed tickets. Customers can select “Flash Seats” during the checkout process, at which point tickets will be applied to their credit card. On event day, all the customer will have to do is swipe their credit card to be scanned at the gate for entry. 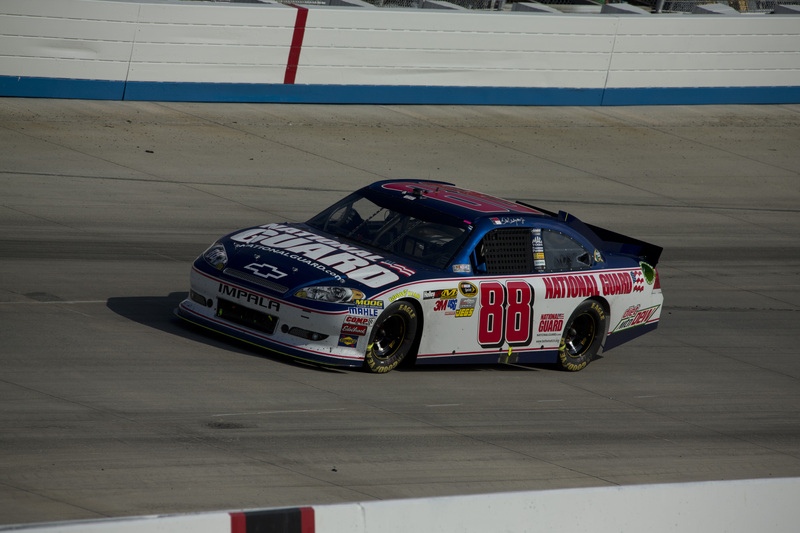 Categories: Delaware, Dover | Tags: Delaware, Dover, Dover International Speedway, Dover Motorsports, Flash Seats, Local, Mid Atlantic, Mid Atlantic Travel, NASCAR, NASCAR news, NASCAR photographs, NASCAR tickets, Photographs | Permalink. Our good friend Gary Camp sent us this information of interest to all NASCAR fans. Carrying on a tradition established more than five years ago, Dover International Speedway will honor the victims of the September 11, 2001 terrorist attacks with its annual 9/11 Memorial Blood Drive. The event will be Tuesday, Sept. 11 in the Rollins Center at Dover Downs Hotel & Casino. The Monster Mile and Blood Bank of Delmarva first teamed up in 2006 for this event, and its success has made it an annual occurrence since. 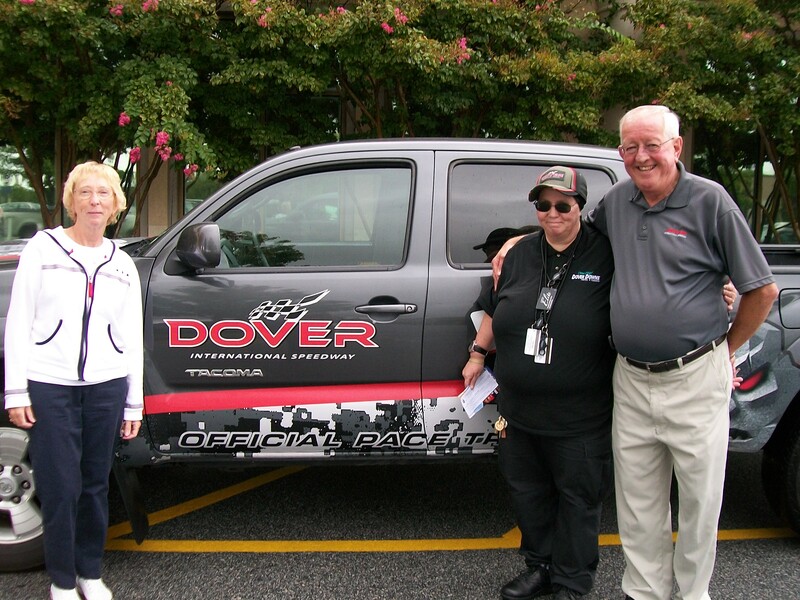 All donors will be offered the opportunity to take a pace car ride around the one-mile, concrete oval with Track Historian George Keller, who has not missed a NASCAR race weekend or other motorsports event in Dover since the track opened in 1969. In addition, 94.7 WDSD-FM will broadcast its morning show from the blood drive, with Sky Phillips and the Wake-Up Crew live and on-site from 5 to 10 a.m. The 9/11 Memorial Blood Drive on Sept. 11 is open to the public and will be held from 9 a.m. to 2 p.m. in the Rollins Center Ballroom at Dover Downs Hotel & Casino. To make an appointment, call 1-888-8-BLOOD-8 or visit http://www.DelmarvaBlood.org. Although appointments are strongly encouraged, walk-in donors are welcome and will be taken if time permits. Categories: Delaware, Dover | Tags: Blood Bank Delaware, Delaware, Dover, Dover International Speedway, Mid Atlantic Region, Mid Atlantic States, Mid Atlantic Travel, Monster Mile, Monster Mile Club, NASCAR, Sports, Stock Car Racing, Travel | Permalink. My friends at Dover International Speedway sent word that Danica Patrick, driver of the GoDaddy.com Chevrolet in both the NASCAR Sprint Cup Series and NASCAR Nationwide Series, will appear for a question-and-answer session in the Monster Mile Club at 11 a.m. before the Sept. 30 “AAA 400” NASCAR Sprint Cup Series race. Joining Patrick on the schedule for the morning’s Q&A sessions are two-time Dover winner Matt Kenseth, driver of the No. 17 Best Buy Ford, and three-time winner at the Monster Mile Ryan Newman, driver of the No. 39 U.S. Army Chevrolet. Patrick, one of the most recognizable figures in all of sports, is running a full-time NASCAR Nationwide Series schedule for the first time this season in the No.7 GoDaddy.com Chevrolet, as well as a limited, 10-race NASCAR Sprint Cup Series schedule in the No. 10 GoDaddy.com Chevrolet. 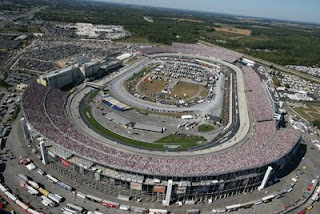 The Sunday, Sept. 30 “AAA 400” NASCAR Sprint Cup Series race at the Monster Mile serves as one of those 10 races. Fans in the Monster Mile Club will have the opportunity to hear all about Patrick’s experiences in both series this year, a recap of her performance in the Sept. 29 “OneMain Financial 200” NASCAR Nationwide Series race from the day prior, her plans to jump into the NASCAR Sprint Cup Series full time in 2013 and much more. The Monster Mile Club opens at 8 a.m. on Sunday, Sept. 30 with a continental breakfast. Trackside Access begins at 8:30 a.m. with the hosted question-and-answer sessions with Patrick, Kenseth and Newman following later in the morning. An all-you-can-eat lunch will be served from 11 a.m. until the start of the “AAA 400” NASCAR Sprint Cup Series race at 2 p.m., at which point the Monster Mile Club will close. NASCAR returns to the Monster Mile on Sept. 28-30, 2012 with the Sept. 30 “AAA 400” NASCAR Sprint Cup Series race, the Sept. 29 “OneMain Financial 200” NASCAR Nationwide Series race and the Sept. 28 NASCAR K&N Pro Series East race. For tickets or more information, call 800-441-RACE or visit DoverSpeedway.com. Categories: Delaware, Dover | Tags: “AAA 400” NASCAR Sprint Cup Series, Danica Patrick, Delaware, Dover, Dover International Speedway, GoDaddy.com Chevrolet, Local, Matt Kenseth, Mid Atlantic States, Monster Mile, Monster Mile Club, NASCAR, NASCAR Nationwide Series, NASCAR Sprint Cup Series, OneMain Financial 200, Ryan Newman, Sports, Stock Car Racing, Travel | Permalink. Matt Kenseth, driver of the No. 17 Best Buy Ford in the NASCAR Sprint Cup Series, will appear for a question-and-answer session in the Monster Mile Club the morning of the Sept. 30 “AAA 400” NASCAR Sprint Cup Series race. Joining Kenseth on the schedule for the morning’s Q&A sessions is three-time Dover winner Ryan Newman, driver of the No. 39 U.S. Army Chevrolet. Kenseth, a two-time victor at Dover, including in the 2011 spring race at the Monster Mile, and this year’s “Daytona 500” winner, has been atop the standings for the bulk of the season and is a near-lock to make the Chase for the NASCAR Sprint Cup. As the Sept. 30 “AAA 400” serves as race No. 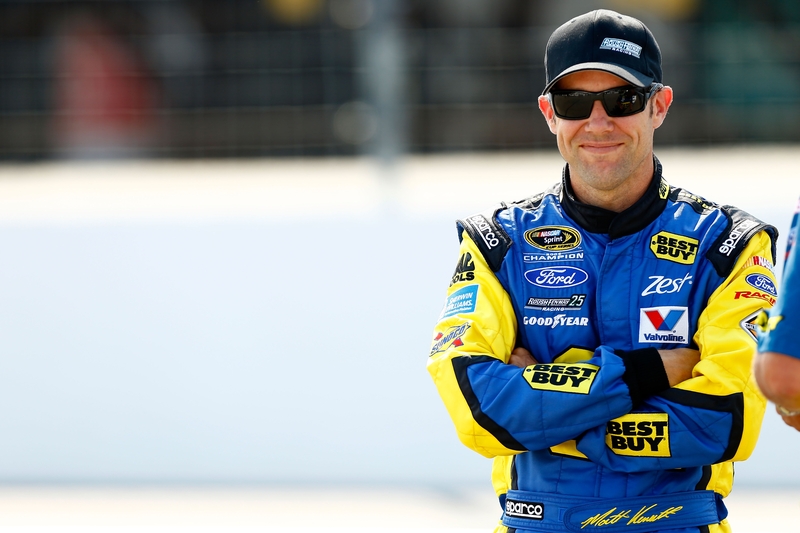 3 in the 10-race Chase, fans will get to hear about Kenseth’s strategy, his expectations for the Chase and that day’s race, and how he plans on making a run for his second career NASCAR Sprint Cup Series championship. For tickets or more information, call 800-441-RACE or visit www.DoverSpeedway.com. Categories: Delaware, Dover | Tags: Delaware, Dover, Dover International Speedway, Matt Kenseth, Monster Mile, NASCAR, Ryan Newman | Permalink. The day of Monster Racing starts with a student-driver’s check-in at the start-finish line. Monster Racing has a variety of packages available, from a four-lap passenger ride to a 30-lap drive program. Many participants receive their day-at-the-racetrack as a gift. Monster Racing sends all student-drivers a Rule and Safety Handbook in advance. The focus is on creating the excitement of a racing event, not on speed. Monster Racing has specific rules for the safety of the drivers, crews and spectators. The requirements for participation as a driver in Monster Racing are fairly basic; you must be 18 years old and have a valid driver’s license. You need to be in good health, and physically able to enter and exit the race car on your own. Cars are sized to fit almost all size drivers comfortably. For safety reasons, the seats are bolted to the car frame, and don’t adjust. Monster Car Racing will ask for some personal information in advance, including your height and weight. You’ll be assigned to the car that best fits your size. Drive order is set to maximize car rotation through your driver class. You’re welcome to bring family members or friends with you to share your day. They can watch you drive from the pits or share in the fun by taking a ride with one of the instructors. Children under the age of 18 have to watch from a designated safety area. Cameras and video equipment are welcome. Once you’ve checked-in, driver-students are driven around the racetrack for an informative ride loaded with driving tips and safety reminders. The drive also familiarizes the students with the “Monster Mile”- including its 24 degrees of banking through the corners and nine degrees down the shoot. The 24 degrees feels a lot steeper than it sounds when you’re parked and tilted sideways in a van! After the ride around the track, it’s time for the students to get into their suits and head for the drivers’ meeting. Monster Racing provides a fire resistant driving suit, driving helmet, and driving gloves for all participants. They suggest you wear comfortable, loose fitting street clothes under your driving suit. In the drivers’ meeting, one of the driver-instructors reviews safety procedures, flag signals, and provides more driving tips. The driving experience consists of a “follow the leader” format. In most cases, two students drive behind one instructor, and maintain a space of six to eight car lengths. Speed increases every lap. Student-drivers are not allowed to pass one another, but if you get stuck behind a slower driver, don’t worry. The drivers pull over, and the order of drivers switched to allow the instructor and faster student to proceed at a higher speed. All of this preparation leads up to the main event: driving the cars. After the meeting, student-drivers walk along the pit road and examine the race cars; snapping pictures standing next to their favorites. A dry erase board posted on the concession stand indicates the order of the student-drivers. Those who had signed up to ride in the passenger seat with one of the instructors are called to the racetrack. After watching the instructors drive, and hearing the enthusiasm of their fellow students, the remainder of the student-drivers are even more anxious to get behind the wheel. If some engines can be described to purr, the race cars’ are more akin to a full-throated snarl. It’s as if they resent being tethered to the pit road, and are as anxious as their drivers to be off racing down the “Monster Mile”. Some drivers pace along the pit road, or watch the other drivers on the track, while waiting their turn. The excitement is palpable, contagious. Soon it’s your turn, and you climb through the window into the driver’s seat. There are last minute safety instructions, including how to use the fire extinguisher, as they strap you in. Engine noise is loud, and you listen carefully to those last minute tips- but then you realize they’re pulling your leg and telling you remember to relax and breathe. The car is remarkably responsive and straightforward to drive. You ease off the pit road, ready to follow the lead driver. As promised in the drivers’ meeting, the first laps are taken slow, to acclimate you to your car. You get the green flag and you’re off. As your confidence and speed increase, you are pushed deeper into the seat on every turn. Yet the tires stick to the track as promised, and the car performs solidly and nimbly. Too soon the checkered flag flashes, and your ten laps are over. Bill Campbell, of Chesapeake City, was confident he would go even faster on his second 20 laps. Speed, he said, is not the important part. As Monster Racing emphasizes, the key factor is the excitement of the racing experience. This story was first published in the News Journal in 2002 under the byline of Gail A. Sisolak. All rights reserved. Categories: Delaware, Dover | Tags: Delaware, Dover, Dover International Speedway, Monster Mile, Monster Racing, NASCAR | Permalink. Imagine a perfect summer morning; a clear blue sky covers Dover International Speedway. It’s hot on the pit road, and as you walk around “your” Winston Cup car, it’s easy to envision thousands of cheering fans filling the stands. Welcome to the world of Monster Racing, the people who will strap you into authentic Winston Cup, Busch Grand National or Ford Super Truck Series Racers and give you the opportunity to drive the “Monster Mile” at Dover International Speedway. This is the real deal, said Operations Manager Ken Dyer; you are driving genuine “Cup cars”, not cars built to look like racecars. They’ve all seen race action somewhere, and have been retired, usually because a Winston Cup team has decided to build the “next generation” or improved car. Increasing interest in motor sports has led to an increase in those seeking the excitement of the racing experience. In June and September, the Dover International Speedway draws over 250,000 race fans for the two NASCAR Winston Cup Races it hosts each year, said John Dunlap, Director of Public Relations. In his opinion, fans from north Virginia, the Baltimore area, Philadelphia, and New York City come to Dover to experience what a race weekend is like. 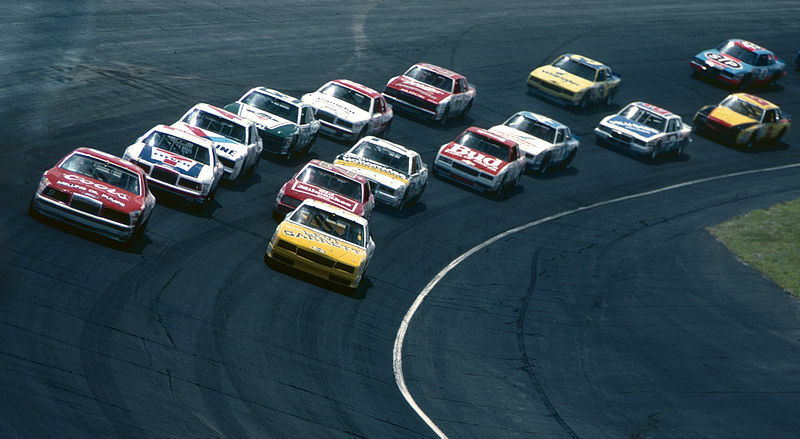 Dover International Speedway has grown from 22,000 seats in 1986 to its current 140,000 seats, mirroring the national growth in interest in racing. Once ESPN and FX television networks began broadcasting the races, and drivers acquired fans, the popularity of the sport took off. Categories: Adventure Travel, Delaware | Tags: Adventure Travel, Delaware, Dover, Dover International Speedway, Monster Mile, Monster Racing, NASCAR, Sports | Permalink.